At Goode Bookkeeping, we make QuickBooks Online management and implementation easy and efficient for your business. Our team of professionals has experience working with a wide spectrum of small businesses. We can customize your application to meet your trade-specific accounting needs. Our team works with you to set up your chart of accounts and integrate key financial data activity. We perform the tasks necessary to establish a smooth running system that’s geared to your business needs. We customize your QuickBooks Online management system to give you a simple way to manage your business financials 24/7. QuickBooks Online is a secure cloud-based platform. The rich online functionality makes it safe, simple to sync the financial elements of your business. We can set up your QuickBooks account with a level of service that best meets your unique business needs. Once we’ve established your online accounting system, you’ll have two simple ways to update your financial records. We can arrange to have your invoicing, payment, and banking data automatically integrated into your QuickBooks account. If you prefer more control, you can choose a data-upload option. 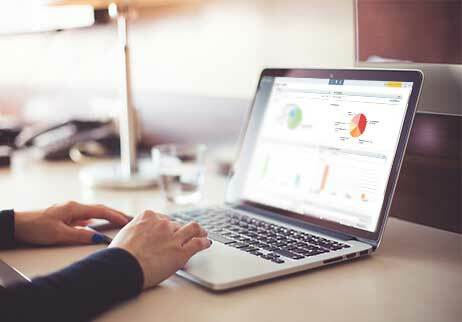 Because QuickBooks Online management is cloud-based, you may access your account via your office computer, laptop, smartphone or other digital devices and update your data when and where you choose. QuickBooks saves you valuable time by automating your business accounting. It’s cloud-based software, so it syncs easily with your business accounts. Our QuickBooks Online management gives you efficient options for managing your time, effort, and money. You can send invoices, receive payments via credit card, and make ACH payments to your bank. QuickBooks transmits your financial data to a ledger that keeps your information accurate and current. Your QuickBooks Online invoicing feature allows you to bill customers and receive payments. You can generate invoices and send them directly to your customers. Online invoicing gives your customers the ease and convenience of an online payment option. When invoices are paid, the funds can be automatically forwarded to your bank account and your accounting data will reflect the deposit. That gives you faster invoice turnaround and faster access to your incoming funds. We can customize your online invoices to incorporate your unique branding and business style. The virtual invoices you send can have the design, color scheme, and business logo that help you maintain and enhance your business identity. When you can easily track the money that flows in and out of your business it’s easier to track your success. We can set up your QuickBooks Online managementsystem to incorporate the features and tools that make money management tasks easier for you. Goode Bookkeeping customizes your system with the latest cloud-based technology. You’ll have 24/7 access to key financial data. That means you can track your business expenses whenever it’s convenient to your busy schedule. You don’t always have time to look at the numbers behind your financial success but with QuickBooks Online, it’s there when you need it. Whether you’re filing your taxes, applying for a small business loan, or just want to check on your cash flow, you can easily access the data you need. QuickBooks Online presents Profit and Loss statements, balance sheets and customized financial reports in simple, clear formats that are easy to read and understand. Shannon Goode and Bookkeeping Express is a first class operation with a work ethic that is undeniable. If your looking for a great bookkeeper Shannon and his team are a great group to work with to handle your business accounting needs. If you need bookkeeping services, you can't go wrong with Goode! Shannon Goode is a true professional and an asset to the business community. I do so with great pleasure. Shannon is a very honest business owner who always has his customer's interests in mind. Amazing people, Amazing work. An absolute pleasure to work with. The absolute best!! Great results everytime and an absolute pleasure to work with. I completely trust them to do an efficient and accurate job.